India U-15 girls were crowned Champions of the SAFF U-15 Championship after defeating defending champions Bangladesh U-15 by a solitary goal in the final played at the Changlimithang Stadium in Thimphu, Bhutan (August 18, 2018). Sunita Munda’s strike in the 67th minute made all the difference between the two teams. It was a hard-fought victory with both teams having hit the woodwork once. The Indian girls started in an attacking fashion and as early as the 2nd minute, Avika Singh’s free-kick rattled the bar and off the rebound, Shilky Devi’s header went inches wide. Three minutes later, Sunita Munda with a solo run burst into the rival box but only with the opposition goalkeeper to beat, she fumbled. Spurred, the Indian girls dominated possession and created chances almost at will. Kritina Devi’s speed down the flanks proved to be a constant threat for the opposition defence. The opposition custodian saved her shot in the 27th minute as India pressed for that inevitable goal. However, much against the run of play, the Indian defence fumbled in the 43rd minute when defender Ritu failed to clear her ball, allowing Bangladesh a clear shot at goal. But striker Anuching Mogini failed to find the net from close range as both teams headed to the interval locked goalless. In the second half, the trend stayed the same with the India U15 girls dominating possession and they were finally rewarded in the 67th minute. In the 66th minute, Avika Singh found Sunita Munda in the box but the rival defence managed to clear it for a corner. Form the resultant corner, Sunita found the back of the net after she connected from Lynda Kom’s cross. Having not many options, Bangladesh went all out in the attack. In the 76th minute, Bangladesh hit the bar. However, the Indian defence stood stern and goalkeeper Manish made agile saves in the dying minutes. 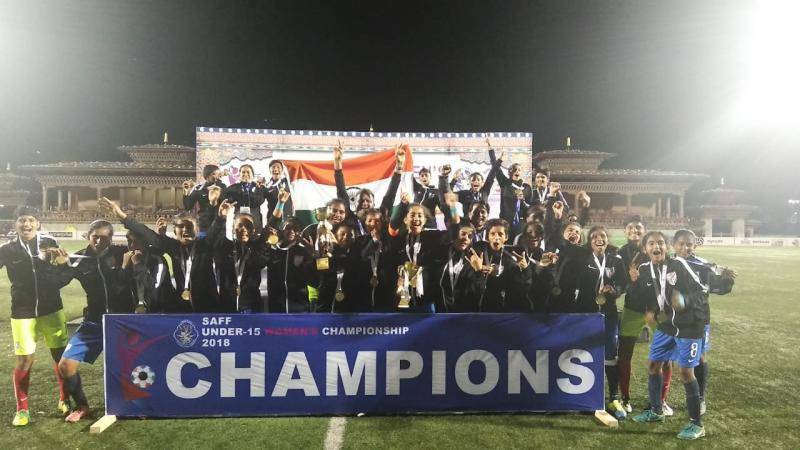 The Indian U-15 Women scored sixteen goals in four matches including the final and semi-final and conceded just one all throughout the Championship. Previous article Facebook secures La Liga rights in India to show every game from Spanish soccer’s top flight for free.